How big was the largest shark to have ever lived? Do you like to go swimming in the ocean? If you've ever seen a scary movie like Jaws, you may be a little bit nervous about what sea creatures might be lurking below the surface. Could a huge, man-eating shark be waiting out there just beyond the breaking waves? The good news is that the answer is…probably not! Sure, you hear about shark attacks from time to time, but they're actually a really rare event. At most beaches around the world, the probability of fun hovers around 100%, and the chance of a shark attack hovers just above 0%. Sharks have fascinated kids and adults alike for many years. These fearsome ocean predators move through the water with amazing speed. Their razor-sharp teeth can strike fear into the hearts of anyone who sees them up close. If you've seen enough movies or television shows about sharks, you might be under the impression that all sharks are humongous. That's not really true. There are many different types of sharks and some of them aren't very big at all. But, of course, there are some giant sharks, too. And that's what today's Wonder of the Day is all about. So exactly how big is the largest shark? The answer depends upon whether you're talking about the largest shark alive today or the largest shark to have ever lived on Earth. Those are two different sharks of different sizes. The largest shark to have ever lived on Earth is thought by scientists to have been the megalodon. Its name comes from the Greek words meaning “big tooth." The megalodon is an extinct species of shark that roamed the waters of Earth over 1.5 million years ago. Not only was it the largest shark to have ever lived on Earth, scientists believe it's probably one of the biggest, most powerful predators of all time. Megalodon fossils have been found that lead scientists to believe the giant shark could have reached a total length of over 50 feet with a body mass of over 50 tons! Today, the largest shark roaming the oceans is the huge whale shark. Unlike the megalodon, whale sharks are not predators. Instead, they're slow-swimming giants that eat mainly plants and plankton. Although not the size of the megalodon, whale sharks are still really big. They can grow to be over 40 feet long and weigh over 15 tons, which makes them the largest fish in the world. They are gentle creatures that will often allow swimmers to catch a ride with them as they swim along coral reefs. If you don’t visit Wonderopolis tomorrow, we’re going to tell on you! Do you like sharks? If so, be sure to check out National Geographic's Photo Gallery: Sharks online. What shark would you least like to meet if you were swimming in the ocean? What fascinates you the most about sharks? Did you know that sharks constantly lose and regrow their teeth? Many people have made a hobby out of searching for and collecting shark teeth. Read Why Do People Collect Shark Teeth? online to learn more about shark teeth and this interesting hobby! Ever WONDER what life is like for a whale shark? Jump online to watch National Geographic's Whale Shark video. Scientists attached National Geographic's Crittercam to whale sharks near Australia's Ningaloo Reef. In this area, tourists can swim with whale sharks. Scientists wanted to see how the whale sharks behaved around tourists. Watch the video to see what they learned! i think whale sharks are totally cool and layed back i think it would also be very scary crossing paths with a megalidon shark if they were still alive! That's cool, meg! Thanks for sharing! How do you answer all these questens in less then a day? Are you thinking the Marianas Trench? We're not sure if a megalodon was spotted there or not--but it's super deep and has lots of -interesting- creatures! Thanks for providing some other opinions about the megalodon, Salty Springs. Hi, Gavin! What is your favorite shark? Luckily, we have even more shark Wonders for you to discover! We agree with you, haml0t! That would be true if the megalodon was not extinct! Try rereading this Wonder one more time to find out what the largest living shark species is! Correct!! Thanks for sharing, Willow! We hope that no more sharks go extinct, either! They are very important to our oceans' ecosystems!! Sorry that you didn't like this Wonder, Lydia! What is your favorite Wonder?? My last 2 comments did no go through and they weren’t bullying. And in one of them took a little y.l write them so what happened? We're sorry for the delay, Ssth!! We were a little behind on commenting, but you should see them posted now! Keep the awesome questions coming!! Thanks for sharing, Seth! We'd love to learn which website you visited to check this information! Thanks for being a great Wonder Friend! Thanks, esmeralda! Have you seen Wonder 1244: How Many Teeth Do Sharks Have? It sounds like you know a lot about the megalodon, Seth! Are sharks your favorite animals? Great question, waylon! We did some digging and discovered that there were probably multiple reasons why megalodons became exctinct. This article from ReefQuest Centre for Shark Research will explain more! Hi, WonderMan Fan!! We like your username!! Hi, mia! What did you think about this Wonder? Thanks for sharing, Allisson! If you like sharks, you may like learning more about Wonder 1244: How Many Teeth Do Sharks Have? We're thrilled that you like this Wonder, UNKNOWN! Thanks for stopping by! Isn't it fun to Wonder with friends, darien? We're glad you're WONDERing with us!! Can you imagine? ?😱 Whew! Close call, Tanner! Hey there, gavin! Thank you for sending us your greetings! Thats sooo cool but why do they have one side soft and one side rough? What's "wrong," Yuyu? Do you want to meet a shark? That's very true, Carson! Sharks are apex predators, meaning they're at the top of the food chain. They help keep other populations of fish at normal levels, which in turn helps the ecosystem! I would recommend this to a friend because it tells a lot about the megalodon.My favorite fact is the megalodon weighed about 50 tons. Its the megalodan not the whale shark i would know because i can hear the roars of the megalodan!!! Megaladons are extinct and have been extinct. We're SUPER glad you liked this Wonder of the Day, John! You might also enjoy these Wonders! :) #1244 How Many Teeth Do Sharks Have? #398 How Many Sharks Are In the Ocean? #42 How Big Is the Biggest Whale? actually the meglodon isn't extinct there is still one lurking the ocean. Most people believe that they are but really they aren't. They can mate with great whites and we need to get it out of the ocean before it can other wise the population will grow and there will be more attacks each year. Wonderopolis what do you mean when you say "Welcome back, Bryce! That's what makes the world GREAT! :)"? Hi Salty Dark. We think it's great that Bryce has an opinion. Thanks for WONDERing! I wish I was there too. I wish I was a guy. That was cool but not many DIFFERENT sharks. I didn't even see the video only l could here the music. That makes us sad that you can't see such an amazing video about sharks. Everything is working here in Wonderopolis. You may want to check back later. I love sharks and I think this is very interesting! Another interesting species of shark is the Goblin Shark! We're so glad you like sharks, Wonder Friend Bob! We bet you know a lot about sharks. What is your favorite shark fact? I thought Megladon was 30 feet long because I saw a movie on animal planet where scientists found Megladon on an island near an island. It also attacked a boat! This wonder was awesome!!!!! I loved this wonder! I have to say sharks are my favorite animal. I did know about Megladons because I have studied them but I don't know why they are extinct so maybe you can answer my question to that? How is there a whale shark? VERY COOL!!!! I learned something new... " great whites AREN'T the biggest." I used to think that sharks would try to devour me but now I know that as long as you don't mess with them they won't hurt you. The largest shark alive is the great white shark or the whale shark. The biggest shark that is dead is a megalodon. The largest shark in the world is the whale shark it lives in the Atlantic ocean and the Pacific ocean. The whale shark only eats frail it doesn't eat meat like other sharks. Frail is little tiny fish that live in the sea. Cool I love sharks I wonder how sharks lose their teeth??????? Dear wonderopolis, My favorite shark is the great white shark, what's your favorite shark? Hi Wonderopolis I always thought the great white shark was the biggest but it is that is. Did you guys see any other vicious sharks? The megaloden is huge! That is really huge! I wonder if another shark will be the biggest. I cannot belive even if the great white shark is the 2nd biggest shark it is not that aggressive as the bull shark. I wonder why is that. Where do bull shark breed? That was so cool. But I thought that it was kind of weird. My sister is deadly afraid of sharks so she wouldn't read it or watch the video. I love sharks though so I thought it was cool. COOL I thought shark attacks happen a lot now we don't have to worry about sharks. GREAT POST! ME AND MY friends in my class loved this video! I learned a lot about the two different sharks, the Megalodon shark and the Whale shark. 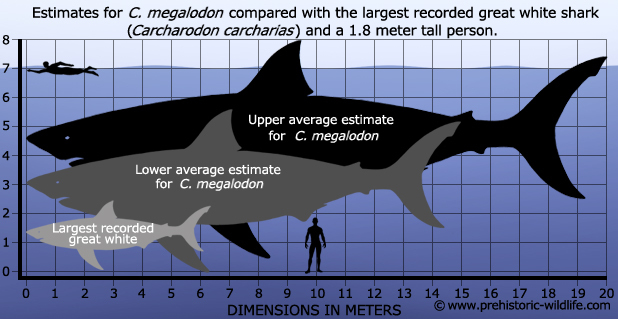 The Megalodon used to be the largest shark in the whole world til it became extinct. Did you Delete "Your Mother's" comment for use of mild language? What a great wonder! We loved learning about the whale shark! Cool, I want to ride on a whale shark!!!!! :D Sounds like fun! Hello wonderopolis I think today's wonder was spectacular. My mom is always terrified of sharks and won’t go in the ocean because of sharks; she says it’s because of the movie Jaws so when I showed her your video she totally freaked out. I said that they’re actually harmless, but when I showed her a megladon she just walked out of the room. This wonder made my top ten favorite wonders. Have you ever heard of the mega great white shark? It is extinct but... it was over 60 feet long. I wonder how fast a Megalodon swam. Thanks for sharing that interesting information, Tyler! That's pretty fast! Keep up the GREAT work! The largest shark to have ever lived on Earth is thought by scientists to have been the what? agreat white shark Not Quite! The largest shark roaming the oceans today is what? dboth (B) and (C) Correct!